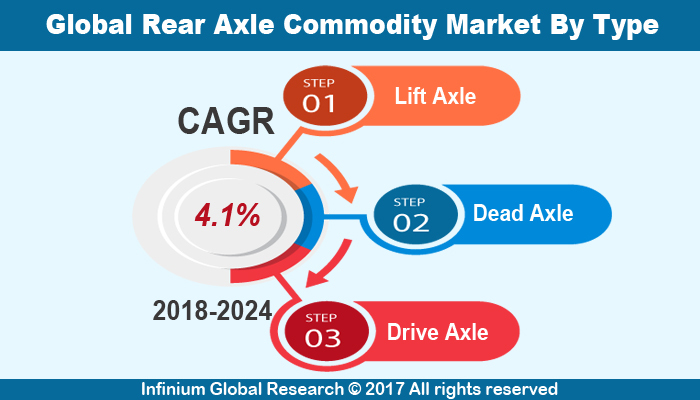 A recent report published by Infinium Global Research on rear axle commodity market provides in-depth analysis of segments and sub-segments in global as well as regional rear axle commodity market. The study also highlights the impact of drivers, restraints and macro indicators on the global and regional rear axle commodity market over the short term as well as long term. The report is a comprehensive presentation of trends, forecast and dollar values of global rear axle commodity market. According to the report the global rear axle commodity market is projected to grow at a CAGR of 4.1% over the forecast period of 2018-2024. Rear axles ensure the function of steering, driving, and braking of the vehicles. Additionally, rear axle lies between the driving wheels and the differential gear and transmit power from the differential to the driving wheels. Light-weight rear axles are designed to meet the consumer demand nevertheless they challenge for the manufacturers is to maintain its quality. Increasing need for fuel-efficient vehicles along with light weight automotive parts are the factors driving the growth of the rear axles commodity market. However, hike in fuel prices, expensive vehicle cost and inflation in various countries is likely to affect the sales of the rear axle commodity market. On the other hand, the suppliers are working together with the automobile manufacturers to develop improved and efficient products. Furthermore, the demand for passenger vehicles is expected to provide several growth opportunities for the key players in the rear axle’s commodity market. In addition, the need for compliance with various emissions norms, changing consumer demand along with safety comfort and security needs are enhancing the demand for the rear axle’s commodity market over the years to come. Among the geographies, Europe holds the largest share in the rear axle’s commodity market followed by Asia-Pacific. Moreover, leading companies are setting up manufacturing plants in countries such as China, India, and Brazil along with Russia and countries in Eastern Europe due to the low cost of manufacturing vehicles. Moreover, the increasing demand for All Wheel Drive (AWD) vehicles is anticipated to serve as a great opportunity for the rear axle manufacturers in the Europe and North American regions. The report on global rear axle commodity market covers segments such as type and application. On the basis of type the global rear axle commodity market is categorized into lift axle, dead axle and drive axle. On the basis of application the global rear axle commodity market is categorized into SUVs, MUVs, luxury vehicles, heavy vehicles, and economy vehicles. The report provides profiles of the companies in the global rear axle commodity market such as Daimler Trucks North America LLC, ROC Spicer Limited, Talbros Engineering Limited, GNA Axles Limited, Meritor Inc. and American Axle Manufacturing Inc. The report provides deep insights on demand forecasts, market trends, and micro and macro indicators. In addition, this report provides insights into the factors that are driving and restraining the global rear axle commodity market. Moreover, IGR-Growth Matrix analysis given in the report brings insight into the investment areas that existing or new market players can consider. The report provides insights into the market using analytical tools such as Porter's five forces analysis and DRO analysis of rear axle commodity market. Moreover, the study highlights current market trends and provides forecast from 2018-2024. We also have highlighted future trends in the rear axle commodity market that will impact the demand during the forecast period. Moreover, the competitive analysis given in each regional market brings insight into the market share of the leading players. This report will help manufacturers, suppliers, and distributors of the rear axle commodity market to understand the present and future trends in this market and formulate their strategies accordingly.